As a movie loving child of the 80's who grow up with a Commodore 64, Atari 2600 and so on, not a moment of Ready Player One was lost on me. What a fantastic, nostalgic read! 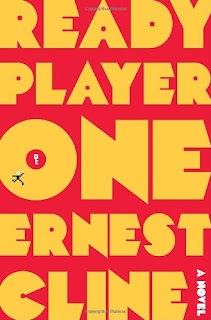 I read Ready Player One over the Labor Day weekend. It was the PERFECT book for a long weekend. I found myself slowly savoring all the nostalgic elements in the book and reminiscing about my childhood. It's one of those books where there may be problems with the story, but who cares?! You didn't care that the pixelated dragon in Adventure looked more like a deformed duck*. You had fun playing it anyway! And Ready Player One was a fun read! It was an adventure quest much like the movies I watched over and over again until the VHS tapes diminished into snow and no amount of "tracking" was enough to fix them. If you ever geeked out in the 80's, Ready Player One will take you home again. If you didn't geek out in the 80's, I have a lot more recommendations for you than just Ready Player One! *I totally stole that deformed duck reference out of Ready Player One. Were you an 80's geek? Spill it! What movies/games were on your most played list? Oh my God... While technically I was born in the 80's... so I can't really be an 80's geek seeing as I was only 7 when the decade ended, but I LOVE the 80's! I must have this!!!! Man, television used to be so much simpler and better!